And they were heroes, everyone who stepped from landing craft and waded ashore at Salerno, not only infantrymen, but artillerymen, medics, engineers, signalmen, ordnance and quartermaster men, recon troops and headquarters personnel. 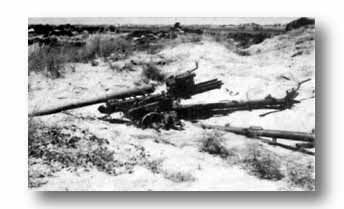 On a confining beachhead shells played no favorites; supporting troops to the rear proved equally as vulnerable. As the operation unfolded, untested rookies matured into battle veterans in a single day. T/Sgt. Charles E. Kelly, the 143rd's one-man army, emerged as the war's most publicized and beglamored GI. The "Commando" Kelly legend began with his famous stand at Altavilla where he heaved 60mm. mortar shells from a second story balcony, killing a score of Germans, and virtually saving the day. It culminated in a swarm of moving picture, biographical, and advertising offers. His homecoming parade in Pittsburgh introduced the fad of hysterical celebrations for returning veterans. Kelly was first to be decorated with the CMH for action on the European continent. T/Sgt. James Logan, chunky Luling, Texas infantryman landed with the first wave of the 141st's assault echelon and earned his Congressional Medal of Honor on the beaches while still a private. Trying to stave off a fierce enemy counterattack, Logan abandoned cover, shot two enemy gunners, then hurdled a wall and turned the Germans' own gun on them. He liquidated a troublesome machine gun, captured two Germans and then proceeded to kill several more. Sgt. Logan fought on with the Division throughout the entire Italian campaign. Pvt. 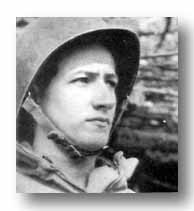 William A. Crawford, an I Company scout of the 142nd Infantry, gained recognition by attacking three machine gun emplacements dug in on terraces in front of his company at Altavilla. Crawling close enough to the first two to throw hand gernades at the crews, he killed the gunners and destroyed their weapons. At the third emplacement, Crawford's gernade proved fatal to only one, but he downed the others as they attempted to escape. Just a little later Crawford was taken prisoner. 1st. 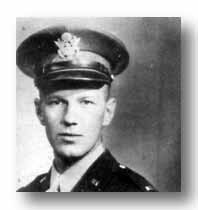 Lt. Arnold J. Bjorklund, 142nd platoon leader, merited award of the nation's highest honor by leading his men up the slopes of Hill 424 and knocking out two machine gun nests and a mortar emplacement, killing all members of their crews with only three hand grenades. Prior to this the lieutenant had fired both his own and a German rifle until he had exhausted all available ammunition. Lt. Bjorklund, seriously wounded during the action, returned to the United States and was presented his medal by the late President Roosevelt at the White House. S/SGT. 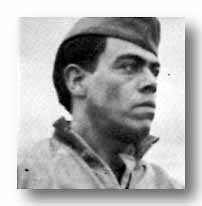 MANUEL "UGLY" GONZALES, 142nd Infantry squad leader, was considered by his company commander to be the finest soldier in the regiment after herculean feats D-Day. His chest ripped by shell fragments, his pack set ablaze by tracer bullets, "Gon" tossed off the pack, grabbed several grenades and consecutively scored kayos on a machine gun, an 88 (above), an ammo dump and a mortar. This performance netted him the Distinguished Service Cross. 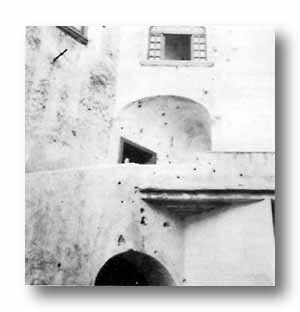 From this balcony in Altavilla, "Commando" Kelly heaved mortar shells on the Germans. Bullet-chipped walls mark enemy attempts to get him. 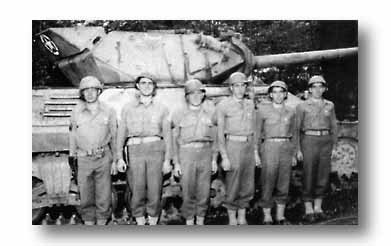 This crew of the 636th TD, "Jinx," struck a crushing blow against the Germans during 25 minutes of fighting in the La Cosa Line defense. The six-man crew, all awarded Silver Stars for gallantry, knocked out 5 Mark IV's, 1 ammunition truck, 1 armored half-track, 1 pill box and a house harboring Germans. Left to right: S/Sgt. 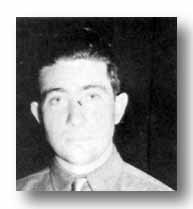 Raymond G. Murphy, Jacksonville, Fla.; Sgt. Edwin A. Yost, Gorham, Kans. ; Cpl. 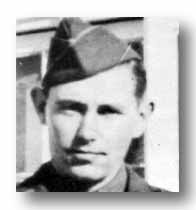 Alvin B. Q. Johnson, Snyder, Texas; Pfc. Joseph R. O'Bryan, New Haven, Ky.; and Privates Clyde T. and Claude H. Stokes, twins from McAlester, Okla.